The inscription that appears on the majority of the activist’s commissioned cartes de visite, “I Sell the Shadow to Support the Substance. 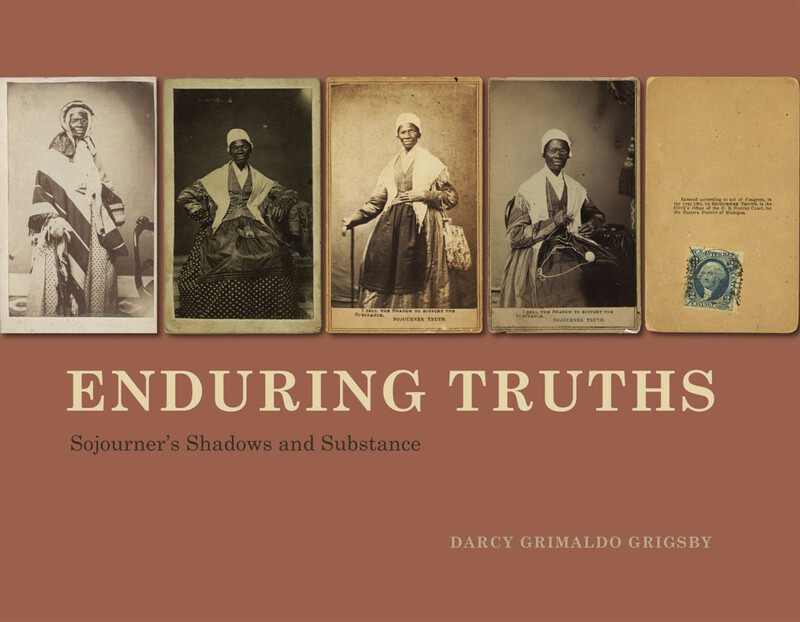 Sojourner Truth,” is commonly known today, and Darcy Grimaldo Grigsby, in Enduring Truths: Sojourner’s Shadows and Substance, fleshes out and dissects these portraits and their famous phrase in an in-depth, original, and fully investigated manner. Grigsby’s reputation as an internationally regarded scholar of French and transatlantic studies precedes her. With Enduring Truths, she firmly establishes her authority as a historian of American photography, as well. Furthermore, Grigsby connects Truth’s images to the history of nineteenth-century currency and the study of photography and copyright before 1865. The author’s in-depth discussion of copyright law, tedious as it may be, is absolutely necessary to establish Truth’s unique acquisition of copyright, and it reinforces the arguments regarding ownership of one’s image. Grigsby ultimately argues that Truth’s portraits, attached to cardstock and widely distributed, should be seen as “paper that stood for economic value” and served as a stand-in for currency. (153) Because Truth supported herself and her causes with the sale of her photographs, Grigsby asserts that her photographs were her currency. She also extends this idea to consider the social currency of the carte de visite, thereby adding additional layers of meaning to the photographs. Throughout the text, Grigsby presents Truth as brave for sitting before the camera. She examines twenty-eight different photographs of Truth, mostly taken during the Civil War and at the end of her life, in the early 1880s. The author’s task was not straightforward, as so many of the cartes de visite, which Grigsby describes as “complex, multilayered things,” look similar. (20) By distinguishing among individual poses, sittings, and sessions, and clearly acknowledging differences, Grigsby keeps the nuanced changes within each individual work clear and organized. Furthermore, she investigates the connections between the visual and the textual by considering Truth’s illiteracy and its impact on her life, acknowledging that the archival record, tempered through a third person, might not be completely accurate. Remarkably, despite her illiteracy, Truth was the publisher, printer, and seller of her own book; her first autobiography was published in 1850 and later reissued. Similarly, the illustrations are novel. Although Truth’s likeness is familiar, based on the wide reproduction and distribution of these that continues today, the nuances of her portraits are particularized by Grigsby. Part of the power of the book today lies in its assemblage and circulation of the full body of Truth’s portraiture. The images Grigsby utilizes for comparison and context are effective and fresh. Necessarily, some frequently illustrated examples are included, such as The Scourged Back, showing Gordon’s scarred and twisted back. Comparing the image of Truth with the image of Gordon, Grigsby argues that, “Truth offers herself as a model for an emancipated, prosperous African American future, a model worthy of emulation,” one different from those who were depicted as victims or martyrs. (79) Primarily, however, Grigsby includes highly original visual comparisons throughout the text. A history of the full scope of Truth’s photographic images is a welcome addition to the field and accords nicely with recent exhibitions and publications about Frederick Douglass and subjects related to the photographic record of the period.2 The form and layout are visually beautiful, setting it apart from these other volumes. The glossy pictures in full color provide a marvelous exception within the current academic publishing market. Ultimately, Enduring Truths combines many of the aspects that comprise the best in art historical scholarship. It is an interdisciplinary wonder that is part biography, part iconography, and part analysis. For anyone interested in the significant impact of Sojourner Truth and her photographs on the nineteenth century, I recommend a cover-to-cover read of this important text. Cite this article: Rachel Stephens, review of Enduring Truths: Sojourner’s Shadows and Substance, by Darcy Grimaldo Grigsby, Panorama: Journal of the Association of Historians of American Art 3, no. 2 (Fall 2017), https://doi.org/10.24926/24716839.1619. About the Author(s): Rachel Stephens is Assistant Professor of American Art at the University of Alabama.